Local 40 Boilermakers and travelers working at the TVA Paradise project receive training on The Boilermaker Code. Dale “Skipper” Branscum, Director-Construction Division Services, trains some 80 members at the invitation of Kiewit and TVA. WHILE A NUMBER of local lodges have hosted Boilermaker Code training for their members since its roll-out in September, signatory contractor Kiewit has taken the proactive step of sponsoring the training in the midst of a project for Tennessee Valley Authority (TVA). 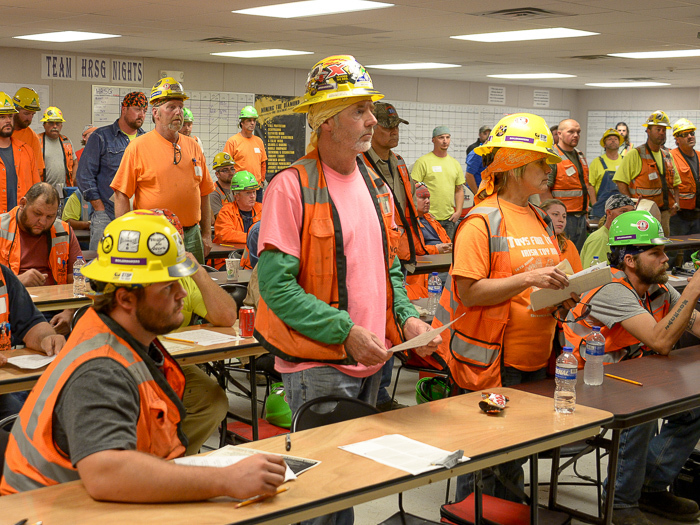 About 80 Boilermakers, mostly members of Local 40 (Elizabethtown, Ky.), attended the half-day training session at TVA’s Paradise Fossil Plant in west central Kentucky, where TVA is building a new combined cycle natural gas power plant that will replace two of the three nearby coal-fired units. Kiewit project management not only granted the members paid time off but also bought lunch and sat in on the training. Glenn Miltenberger, Operations Manager, Paradise Project, said that after hearing about The Boilermaker Code, he contacted Local 40 BM-ST Mike Autry, who arranged with the International to provide a program overview. Miltenberger and Jerry Payton, TVA’s Senior Program Manager for Industrial Relations, both participated during the event by offering their perspectives as representatives of the contractor and the client, respectively, for the project at Paradise. 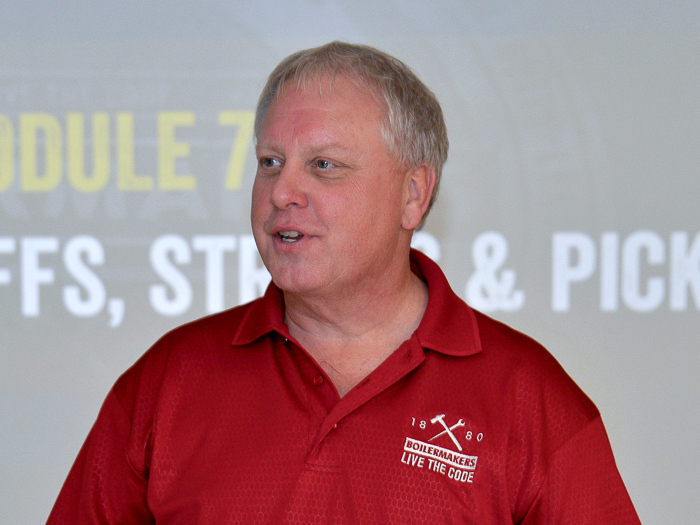 Dale “Skipper” Branscum, Director of the Boilermakers’ Construction Division Services, taught an abbreviated version of the full-day course. It included a film highlighting past mistakes that led to a tarnished reputation and the loss of market share in the construction industry. Ten discussion modules followed the film, focusing on attitudes and behavior that can impact contractor and owner bottom lines — as well as the ability of Boilermakers to secure new work. Now an official MOST program, Boilermaker Code training was developed by Branscum as an initiative by International President Newton B. Jones to elevate member performance and win back market share. A cadre of active and retired Boilermakers along with MOST representatives have joined Branscum in bringing the training to local lodges across the United States. Also attending the Paradise, Ky., event were IVP-SE Warren Fairley, Assistant Director of Construction Sector Operations Marty Stanton, International Rep Dusty Garmon, Local 40 BM-ST Mike Autry, and Communications Director Mike Linderer. At the conclusion of the training at Paradise, all members in attendance stood and recited The Boilermaker Creed, the companion component of The Boilermaker Code.